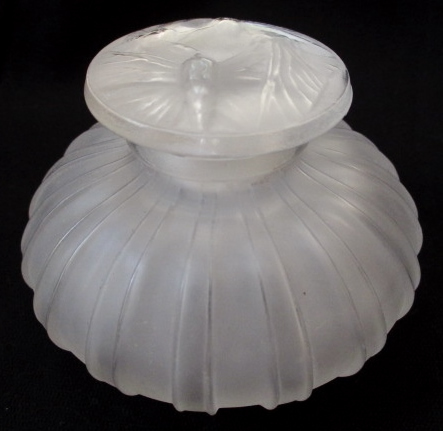 Rene Lalique Perfume Bottle A Cotes Bouchon Papillons: 5.5 centimeters high frosted glass with wide ribbed mold blown design on the container, and a butterflies decorated stopper R. Lalique Perfume Bottle Item: 251299929349. Model: 477 Circa 1911. EU - France - Nice Date of Sale: 2013-07-15 Sales Results: The bottle sold for €1278.55 or about $1675.